Monster Squad is a android based game that involves the player battling hundreds of monsters. The game can be played with both android and iOS devices thereby enhanced its cross platform functionality. Monster squad is an active player game that involves the player traveling across several islands in a mission to fight and capture hundreds of monsters. Monster squad is a fairly easy game to play and basically, the game involves the player starting off with a basic monster. 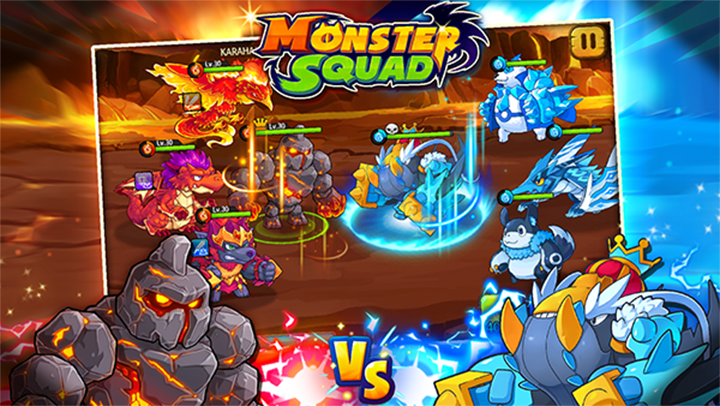 The player is then required to capture as many monsters a they can and enroll the captured monsters in their fighting team to establish an all powerful monster capturing squad. In total, the player is allowed up to a maximum of five monsters with each of the monsters being divided into four categories namely fire, earth, water and neutral monsters. One of the most captivating aspects of this game is the fact that the battles are fairly fast paced. The player is therefore required to rely on their quick instincts during the battles as there is little room for strategy. The game allows players to have full control of their main monsters and they can launch attacks or buffer their opponents. The point system in monster squad is fairly straight forward with various specific rewards being accorded to specific attack moves and these rewards are in the form of energy points which serve to recharge the monster (player) in battle. The player is also able to use the other monsters as they please and can use various settings to enable the monsters complete various attack or battle activities. There are several aspects of Monster Squad that do indeed serve to enhance the overall experience of the game with the first being the game’s pace. The game has an amazing pace that is reasonably fast to enable ensure that the user is engaged throughout the play while at the same time, ensuring that the game is able to maintain an impressive difficulty level. The setting and indeed other key aspects of monster squad are quite impressive. The setting offers an aesthetically appealing background for the game thus serving as a key attraction aspects especially for new players. In addition to the setting, monster squad also features high quality dialogue which serves to enhance the overall experience of the player. An important aspect in any game review is the graphics quality and on this front, monster squad scores a plus for its high quality graphics that make it easy for one to clearly identify their opponents and also serves to enhance the overall quality of the game. The simplified ability to configure the other monster’s combat actions is major downer since it takes away some fun from the game and indeed makes it fairly simple. Secondly, the constant remainder the game’s free to play version can be quite annoying with the frequency of the remainder is significantly high as compared to other similar games. All in all, Monster Squad is indeed an impressive monster capturing game with fast paced combat action, enhanced graphics and high quality dialogue. Feel free to try out the free to play version or purchase the full game for an even greater experience.